Halloween is around the corner and the frenzy is about to start. But it is when the festivities have passed that we realize how much we have spent! We have brought you the tips that can help you to save a huge amount of money if you follow them properly whether it is for decorations, party items, costumes, candies or more. By purchasing candies for Halloween in bulk from a warehouse club can be helpful in saving a considerable amount of money as they have discounts available and prices are less. Also, you can prevent the trouble of going to the grocery store a number of times by buying it all at once. It is advisable that instead of buying just one type of candy, you can purchase it in varieties in order to provide the trick-or-treat lovers a number of choices to select from. 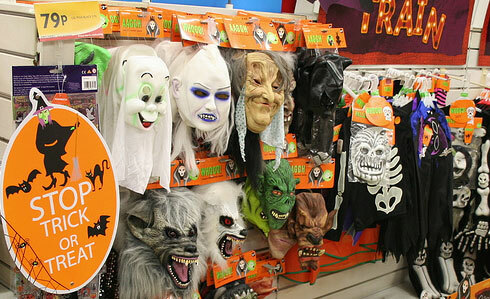 It is always advisable to go through the inventory of party stores present online for Halloween decorations. Whether it is a Halloween party you are planning or the basic Halloween decorations for the house, online party stores have excellent deals to choose from. Something that might not be available at the local store. You can avail various discount offers on bulk purchases, avail the coupon codes and make the most out of offers that are available only online to save your money. If you have decided to use your arstistic and crafty skills, then visit the dollar store or other discount stores to purchase the necessary components needed for decorations. You can make a number of things with these supplies for Halloween decorations such as wreaths, centerpieces, lanterns and various other decor items. In case you are not having enough budget in order to have a Halloween party for the kids or you are thinking to save money, then you can take your friends and family out to places that provide free Halloween activities. You can check out your local community center, school, museums or other local places for events and activities during Halloween. It is advisable to go through the local newspaper, the community calendar at civic centers and even the Facebook pages of companies to know about the free events taking place. If you buy the pumpkins a few days before Halloween then you can save a bit of your money. Also, carve the pumpkins on the day of Halloween to keep them as fresh as possible. There are local stores that sell pumpkins at large discounts at the day of Halloween in order to clear out some of the inventory. If you decide to be resourceful, you can easily find hundreds of tutorials and tips that are present online that will help you to make your own Halloween costumes. Made up of inexpensive items, stuff that can be reused and old clothes, you can make the best costume for yourself this Halloween without spending a fortune. Internet plays an important role in this as you can go to YouTube, Pinterest, Instagram, Facebook and various blogs to get different ideas about costumes. One of the ingenious ways to save money is to make the decoration for Halloween on your own! Look through the attic and cupboards to find all the materials that can be put together to make Halloween decorations. You can search the internet for the best ideas and tutorials. Halloween is a festival enjoyed by all ages of people though children make the best out of it. They dress up fancy, consume candy, and try to scare each other with their tricks. But the actual scary aspect is that if not planned properly, the expenditure on Halloween can take a huge toll on your budget. Purchasing Halloween costumes, candy, special accessories, decorations, and treats for school events can actually bust your bank account. Here are our money saving tips for you to save on Halloween costumes, decorations, and candy during 2015 Halloween sale. Buying the costumes online and early as you’ll get it at the best price thus skipping the mad rush on October 30th.You can also compare the websites while shopping for the Halloween costumes. You can also exchange costumes with some other family or use hand-me-down costumes from family members and friends. You can plan a Halloween costume exchange time with your neighbors to get an even better selection of costumes in a variety of sizes. Skip the masks! Apart from being costly, masks can be dangerous as well. Safe Kids Worldwide warns that “masks obstruct both vision and breathing in kids, and should be avoided.” Skip the cost and the risk and opt for face paint or makeup. It’s both secure and affordable. While shopping for the decorations for Halloween try to avoid the big stores as at the specialty shops you won’t be finding any cheap decor. Keep an eye on the discount stores and search online for much cheaper and affordable things for decoration. Put your creative skills at work and save a huge amount of money by making decorations on your own. There are several methods to make hangings, danglers or jack-o’-lanterns to candles by crafting simple items. Change the light bulbs. For less than a few dollars, you can swap out your normal front porch bulb with a red or orange one to give your home a creepy glow. Don’t be tempted by magazines and internet as they are full of super amazing but often ideas that are over-the-top. Your budget should be always in your mind while preparing. Go for more basic, cheaper items. After all, candy is the paramount interest on Halloween, for both kids and adults. Instead of going all-out on a meal, stick to finger foods with a freaky flair to it! Roast pumpkin seeds. Not only do pumpkins make for great decorations, you can roast the seeds for guests to munch on. Have a Donut-Eating Contest. One of the best yet cheap way to entertain kids at Halloween parties is with a donut-eating contest. Get your donuts from the bakery and attach each to a long dowel with a piece of string. Tell the children to try and eat the hanging donut without hands while two adults hold the dowel horizontally. It’s actually fun! It’s time finally to go out and begin trick-or-treating once all the festivities are done. There are ideas to lessen the cost if you’re going house-to-house or you prefer to stay home and hand out candy, of the age-old trick-or-treating tradition. Use Candy Alternatives. Candy can actually be costly instead take non-candy treats as It’s much affordable to buy a roll of stickers to a child, or grab a huge bucket of plastic bugs at the dollar store. It is a considerable option as children receive huge amount of chocolate, chewy candy, suckers, and gum each Halloween and receiving a little prize, toy, or pencil seems more exciting. Buy Glowsticks. Children are more likely to be engaged in pedestrian accidents on Halloween than compared to other nights, so make sure your kid is as visible to cars as possible. You can buy lighted accessories to ensure that your child is easy to see. Purchase cheap glowsticks from the dollar store as they come with joining fasteners, which can be used to make circles around ankles, necks, and wrists. Get Creative With Containers. For your little monster’s to trick-or-treat you needn’t require the perfect plastic pumpkin. You can be more creative with the candy carrying containers: Pillow cases, reusable grocery bags, baskets, decorated gift bags, and even sand buckets work perfectly for treats. Stay in your neighborhood. You can avoid going to the theme parks and fairs this year and instead have a stroll trip around the block. Keeping the festivities local will help you save on gas, admission and refreshments. Also, it’ll help you keep an eye on your little one and you too can enjoy as much as you can! This fact can’t be avoided that Halloween can be a costly holiday, more so when your kids have high expectations. But by brainstorming new ideas, finishing most of the work by yourself and by being creative with your resources is huge part of the fun of Halloween celebrations with family. Think outside the big box store and get crafty – and you’ll find that Halloween doesn’t have to break the bank. The best ideas to save on Halloween items are by beginning early. In the week following Halloween you can also purchase items for next year. You’ll be getting deals like up to 75% off on decorations and costumes once the festival is over and when the Halloween arrives next year, you will be glad you that you thought ahead, and you will be grateful for the Halloween savings. It’s October and you must be excited for the scariest time and the amazing Halloween sale of the year. Halloween comes with buying costumes, stocking up on candy and treats, planning parties and decorating everything to make your holiday unforgettable. The countdown to Halloween is on and we have hand selected some best Halloween deals for everything including candy to costumes to festive décor. You will also get some Halloween costume ideas for kids, couples, teens and adults. Check out our exclusive Halloween sales from top online stores including Buy.com, Costume Kingdom, Sears, Costume Craze, CardStore, Harry & David, ProFlowers, NBC Universal Store and more. Pick Halloween Last Minute Deals & Free Shipping Coupons: If you haven’t still purchased your Halloween costume, you can go for Halloween last minute deals though stock may be limited. Save up to 40% on Halloween costumes at Kmart.com plus buy 1, get 1 Lemax Spookytown Collectibles FREE & Shipping is also free. We have updated hundreds of last minute deals for Halloween from top online stores. Go for Halloween Clearance Sale: Many online stores for Halloween costumes offer great clearance sale for fantastic costumes for everyone even for pets. Search for the best deals there and save when you shop online. Shop at Macys.com and save 20-40% on Kids’ & Baby Halloween costumes. DIY Haunts: Your creativity can help you to save your wallet on spooky things and make good use of your money for buying after Halloween sale items. Instead you can turn your home scary by using homemade items to create house of horrors. Tricks vs Treats: Skip the tricks & treats this Halloween and make you mom and happy! Little toys for kids like silly bandz can add more to their joy same as candy does. Search for discounts on toys on our websites and save up to 50% from top brands like WalMart, Amazon, Buy.com, Macys.com and more. It is October and you must be excited about the Halloween 2013. Same would be the case with your kids. They must be looking forward to get new Halloween costumes like you. Few simple steps followed can really save you from burning a hole in your pocket every time. Let’s take a quick glance at Halloween costume ideas which can save your money when you shop online at Buy Costumes, NBC Store, Disney Store, Life is Good, Anytime Costumes, Costume Craze, Nike, Adidas, 6PM and more. 1) Use Halloween Coupon Codes: Before snatching a Halloween Costume, it is better that you do your homework. Search for online sites that offer lucrative deals and coupons for Halloween Costumes. Start a month before and keep a close eye at promotions and advertisements. Register with sites like Groupon, LivingSocial, MyVoucherDeals.com and dozens of other deal sites for getting the best bargains on costumes. 2) Pick Last Minute Deals & Free Shipping Coupons: If you are planning to buy a Halloween outfit on the eve of Halloween, you may get 50% discount but the stock may be limited. MyVoucherDeals.com offers you top last minute deals for Halloween costumes from hundreds of top brands online. Shop now and save more! 3) Swop the Halloween costumes: Celebrate the National Halloween Swap day where families exchange these Halloween costumes so that they can save some money and also contribute to the green environment. The day is a part of Eco Mom Alliance Program and consists of various swap locations where trading of clothes takes place. Libraries are a perfect destination for holding such thing and clothes barter can be coupled with various activities and books to turn it into a fun-filled and lively event. 4) Put To Use Whatever You Can: If any of your kids is into sports that can also serve your purpose. You can use the uniform to double up the Halloween outfit. Even you can team up your costume with some accessories and make-up to look best. A little bit of creativity can work wonders for kids Halloween costumes. For instance, you son can get stitched a long black sleeve with a striped white shirt and embellish it with a prison ball and a leg chain. Turn your daughter into a pop-star with a hair-glitter and microphone complementing her flashy dress. Likewise experimenting can really help you arrive at some interesting things. 5) Get Help From Online Tutorials: YouTube is the perfect place to hang-out when your kid is adamant on buying a new Halloween Costume and you don’t approve of him/her. It’s best that instead of arguing with your innocent kids you take some help from YouTube Tutorials. Here you can watch endless videos on how to prepare a Halloween Costume at home without spending those dollars on one-time costumes. Not only it makes you save money but also makes your kid happy. Whoa…a win-win situation for both. 6) Tailor Your Own Halloween Costume: Sewing your own Halloween Costume is a perfect idea for those who want a unique look that too at a very-low cost. What you need to do is run to fabric stores like Hancock Fabrics or Jo-Ann and buy some yards of fabric. These fabrics are very cheap and you can get one for your kids even at 50% off provided you keep a strict eye on the coupons that these retailers roll out before Halloween Fest. Besides clearance section can lend you an attractive deal. 7) Look for Rent or Passed Down Costumes With Heavy Discounts: If you don’t want to buy a Halloween Costume for your kid, that’s perfectly fine as you can get one on rent. There are many shops that rent these costumes. Not only does it save you money but also shelf space. Besides, latching onto new or used clothes with heavy discounts can be really fruitful. While you can get a cheap costume at $10 from stores like Family Dollar, General and Dollar Tree is seen selling costume accessories and Halloween masks. 8) Do Away With Old Halloween Costumes: If your kid desires to purchase a new costume the selling the old one can be a good way to pull money for the newbie. Several local stores and online shopping websites like eBay and Craigslist are some spots where you sell your old clothes. Remember to sell them in and around October as stores will buy even at high prices to boost their sales. 9) Buy A Big-Size Outfit: This may sound weird but it is perfect for those who have young kids. As they don’t seem to remember what they wore last year, you can always buy a bigger size for them. For the current year you can roll up some corners and use pinning up to lend them best fit.